Complete tree services, including: removal, trimming, pruning, thinning, inspecting, and stump removal and grinding. We will take care of the dead branches and wood and get it off your property. Our state-of-the-art cranes and Bobcats will tackle any job required. With licensed arborists, we can take care of tree structure evaluations for you, in addition to anything else you require, such as crown reduction or lot clearing. Nelson Tree Specialist is standing by, ready to provide you with outstanding services. Your satisfaction is our #1 concern! We offer a wide range of Tree Services with one goal in mind – making you a happy customer! We offer a custom approach to tree removal guaranteed to match your needs and budget. 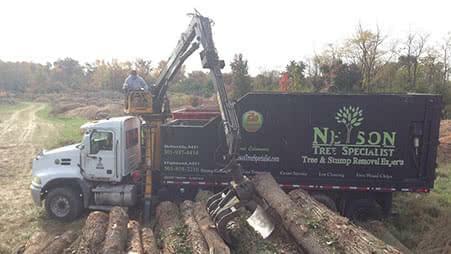 Regardless of the type of tree service you select, ranging from tree removal, trimming, stump grinding or removal, etc., the skilled and insured professionals at Nelson Tree Specialist will get the job done safely. Nelson was very responsive and informative when he visited us. He promised a lot during negotiations and his company completely delivered. He and his crew were very professional, experienced and hard working. Nelson owns all of his equipment and his employees are salaried. They always went the extra mile to make sure the job was done correctly and to make sure we were happy with the job. We would recommend Nelson to anybody for jobs big and small. He’ll do the job right and provides great value and customer service. Wow, what a professional company. I have had a lot of tree work done in the past, but none have been like this. The estimate was painless, he new his job and I did not have to do a lot of explaining. They were able to start the next day. Wow did not have to wait weeks for work to be done! The entire team took safety to the next level, everybody wore hard hats, and they were properly harnessed to the tree. The work was done so fast and the clean up was incredible. Nelson, the owner, is super easy to deal with and really listens to what you want done. I will never use a different tree service again. I can’t recommend them enough!